Like many an anime, My Bride Is A Mermaid revolves around a geeky kid coming to grips with extraordinary stuff happening around him. That some of the stuff in question involves plenty of cute girls is a foregone conclusion. This particular series goes along with those tried-and-true basics, melded with a wild "the girl who saved me from drowning is the scion of a secret cabal of marine yakuza creatures" twist. A confession: although I don't consider myself an anime expert, I have been in the manga business long enough to enjoy the visual artistry, risk-taking, and the very Japanese-ishness of it all. The best anime makes American TV cartoons look lame, even stodgy, by comparison. My own tastes tend to gravitate towards comedies that go for the girly/surreal (like Princess Tutu) or frenetic/outrageous humor (Sgt. Frog). As it turns out, My Bride Is A Mermaid is a bit of both. Despite being loaded with too many characters and indulging in repetitive gags/stories (especially in the second half), the show is sweet, crazy and loads of fun. Mermaid opens with a family vacation to the seaside Japanese town of Seto, with average middle school-aged kid protagonist Nagasumi going with his mom and dad to visit his grandmother. On his first day there, Nagasumi swims too far into Seto Bay and sinks into the murky waters. Just before drowning, however, he's saved by a mysterious figure - a mermaid! Recovering on shore, Nagasumi tells his dad of what happened. The dad is skeptical, but when Nagasumi informs his grandmother of the same tale (tail?) he is surprised to find that a legendary race of mer-creatures have been rumored to live in the bay. The mermaid (named Sun) shows up at the grandmother's home, in human form, to deliver an important, life-changing message to Nagasumi. According to mermaid law, if a human sees a member of her secret mermaid society, he must be executed. The only way out is for the two to be married, and for Nagasumi to be accepted fully into the feared Seto yakuza gang of warring sea-creature gangsters. Sun brings Nagasumi and his shocked parents to her undersea home, where her nurturing mother Ren, short-fused, over-protective father Gozaburo decide the young man's fate with their precious daughter. Sun and Nagasumi have their first date at a seaside carnival, where Gozaburo's goons (including the dreamy, sunglass-wearing Masa and shark-man Fujishiro) monitor the couple's every move. Keep in mind that all this stuff happens in the very first episode. My Bride Is A Mermaid's concept seems something like a teen anime Bewitched - and it does somewhat follow that formula in the earlier episodes where Sun (platonically) moves into the suburban home of Nagasumi and his parents, along with her tiny conch girl bodyguard, Maki (the parents seem kinda non-plussed about having two young girls move in, normal sized or not). 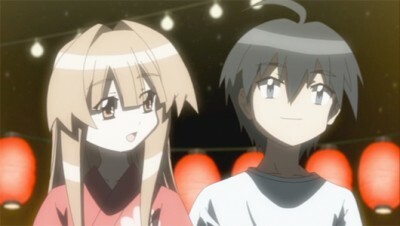 Sun is soon enrolled in the same middle school Nagasumi attends, with Sun's parents and various Seto Gang members installed as faculty (much to Nagasumi's horror). Nagasumi's adjustment to having all these mermaid yakuza around form the crux of the show's humor, and it's in the first twelve or so episodes that the quick-paced gags and extreme, surreal reactions that make up the show are at their funniest. This show indulges often in the typically anime-style moments where a character will have a "freakout" and suddenly take on a simple, cartoony look while babbling on about whatever they're thinking ("Omigod, somebody splashed water on Sun, whatifsheturnsintoamermaidrightnow?!!?"). There's also a lot of visual gags that serve as takeoffs of other anime series. Most of these refer to stuff that this reviewer doesn't know, but they still have a weird quality of their own that adds to the show's gonzo, anything-goes feel. With Nagasumi, Sun and the Seto gang settled (sort of) in school, a bunch of new characters of varying usefulness are introduced. First off is Nagasumi's goofy friend Chimp and Mawari, the tough but cute school monitor who holds a secret crush on Nagasumi. Sun's arrival brings the enrollment of Kai Mikawa, rich corporate heir and Nagasumi's chief rival for Sun's affections (Kai is also an orca-boy with a fear of sunshine and open spaces - go figure). Another new attendee at the school is Lunar, a famous pop star who happens to be the daughter of a rival mer-yakuza gang - and the jealous childhood adversary to the sweet-tempered Sun. Lunar's arrival brings some outlandish plot developments to the series, but she's not a particularly interesting character (being insanely jealous of Sun is her biggest trait) and the writers don't do much with her, once she's in place. That happens more than once with this show. 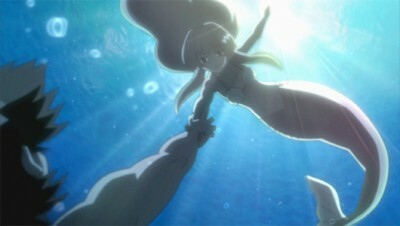 For a show called My Bride Is A Mermaid, the mermaid angle strangely isn't explored too often. Mostly the series centers around Nagasumi and Sun's sweetly chaste relationship and their adventures with their classmates. 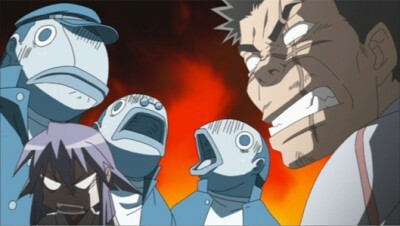 The episodes on discs 3 and 4 generally coast along in predictable ways, although it perks up a bit with the addition of Akeno, a tough-cookie new classmate who is actually another mermaid sent by a rival gang to evaluate and spy on Sun. Another highlight comes in the climactic two-parter in episodes #25 and 26, in which Nagasumi must rescue Sun from a perverted mer-creature party boy who wants to keep her as his slave bride. My Bride Is A Mermaid isn't quite new to U.S. shores. Funimation has already released this series on DVD in two parts (previously reviewed at DVD Talk here and here). This particular package collects all 26 episodes in one nifty 4-disc set, with a MSRP that is only ten dollars more than what the two split sets are priced at individually. It's a good deal, even for an erratic series like this one. The four discs of Funimation's My Bride Is A Mermaid: The Complete Series are packaged in a standard-width, hinged keep case with an attractive slipcover printed on glossy paper. The 16:9 anamorphic widescreen picture on this series is lush and full of beautifully saturated color (don't let the screen grabs with this review fool you). Although the animation on My Bride Is A Mermaid is not as smooth as it could've been, the wild imagery is pretty terrific and these DVDs give it a good presentation. All episodes of the series are presented in an English 5.1 Surround dub and the original Japanese stereo soundtrack, with optional English subtitles. Both options are solidly mixed with no noticeable glitches or badly mixed moments. The English dub is well-produced; I enjoyed watching it with the subtitles to spot the subtle differences in the U.S. and Japanese scripts. Textless opening and closing songs and trailers for other Funimation anime titles are included on discs 2 and 4. All four discs sport un-skippable trailers as well, unfortunately. Appealing leads, nice visuals and plenty of "freakout" gags drive the fishy shenanigans in My Bride Is A Mermaid: The Complete Series (shouldn't it be called My Fiancée Is A Mermaid, however?). The series tends to lag in its second half, but overall it's recommended.